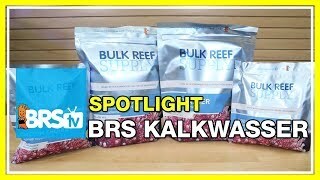 Ultra-pure Kalkwasser for Reef Tanks! BRS Pharma Kalkwasser is not your typical calcium hydroxide. It is made from an ultra-pure source that contains extremely low amounts of aluminum and compared to traditional kalkwasser you can actually see the difference. If you are adding Kalk to your ATO reservoir or a reactor, you will find that BRS Pharma Kalkwasser mixes faster with fewer impurities, and is more even potent than the others meaning you will not have to use as much, saving you money in the long run. 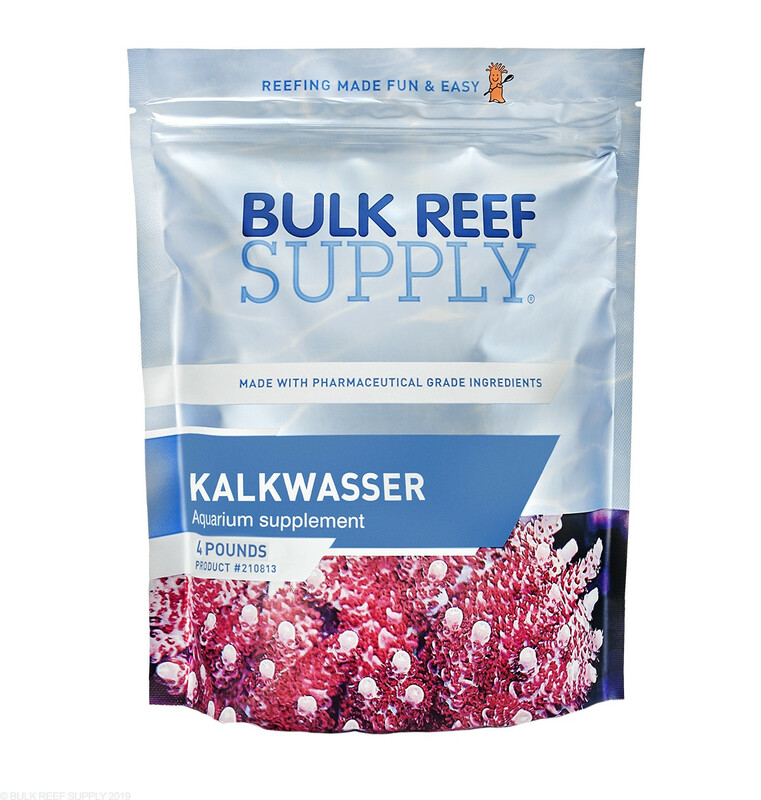 Kalkwasser is the easiest method to maintain calcium and alkalinity levels in a reef aquarium not to mention low cost. 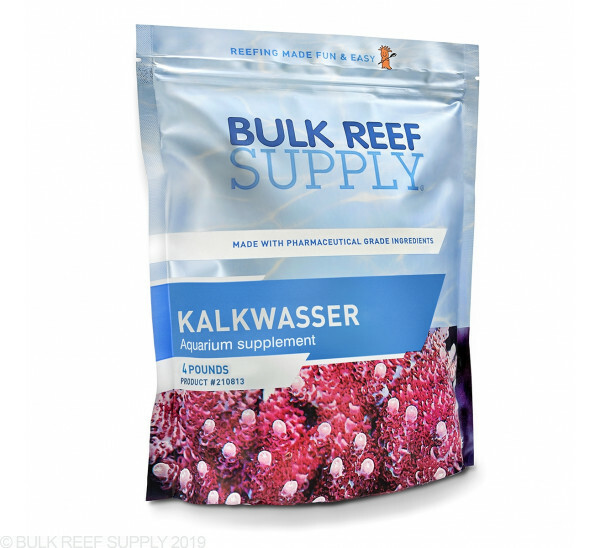 With a few different methods to implement it, if your corals are growing and you need to add calcium and alkalinity, you will more than likely find multiple benefits from using kalkwasser. 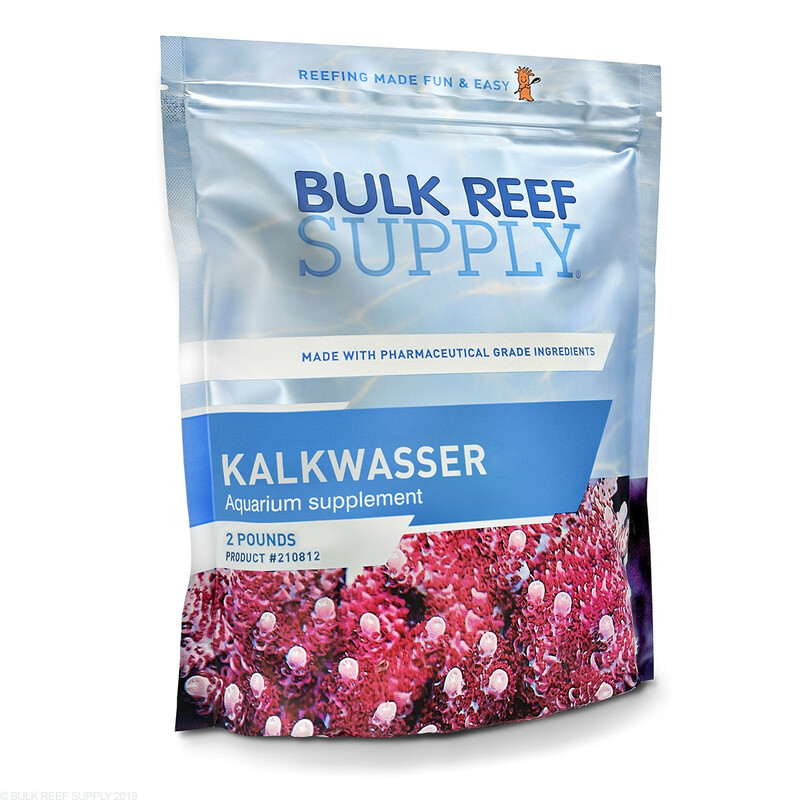 Being the only way to add calcium and alkalinity from a single solution along with helping elevate the pH of your aquarium to helping purify your ATO water even further, there are plenty of reasons to add kalkwasser to your ATO reservoir or set up a Kalk reactor or drip system. By far the most common application for kalkwasser is by adding it to your tanks top off reservoir and then relying on the auto top off system to deliver small amounts of saturated kalkwasser solution throughout the day. We suggest using BRS Calcium Chloride, BRS Sodium Bicarbonate, and BRS Magnesium for General Adjustments to elevate and balance your aquariums parameters before using Kalkwasser. Step 1. Test and adjust your aquariums calcium, alkalinity, and magnesium levels using BRS Calcium Chloride, BRS Sodium Bicarbonate, and BRS Magnesium for General Adjustments. Step 2. Start by establishing the proper amount of kalkwasser to mix into your aquariums top off water reservoir. Step 3. With RODI water fill your top off reservoir & mix in the proper amount of kalkwasser then allow the solution to settle for 30 minutes before using. DO NOT OVERMIX: Excess mixing and air contact will decrease the potency of kalkwasser. Step 4. Place your ATO systems pump or intake line is place 1/2" to 1" above the base of your reservoir, ensuring only the clear slurry is being dosed. Step 5. Activate your ATO and monitor the pH of your aquarium as the kalkwasser solution is being dosed, not exceeding increases of 0.20 pH. Your ATO should be pumping water into a high flow area of your sump or display tank to help prevent precipitation. Adding kalkwasser too fast may result in precipitation rendering it ineffective. Step 6. Monitor your aquariums calcium and alkalinity daily, adjusting the strength of the kalkwasser solution in your top off reservoir as necessary. Note: We highly suggest using a pH controller to prevent against pH spikes and overdosing. Simply refill your container with fresh RODI water and add the proper amount of kalkwasser per gallon of new RODI water and mix. It is recommended to clean your ATO reservoir regularly, though you do not have to every time you replenish your ATO container. 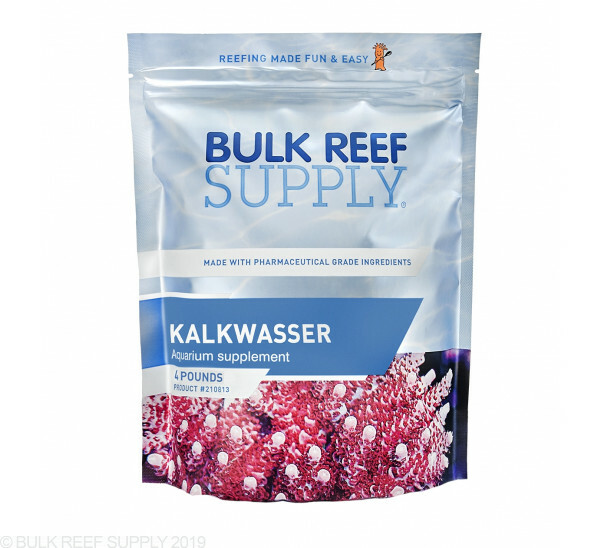 Kalkwasser or Calcium Hydroxide Ca(OH)2 when mixed with fresh RODI water contains a perfect balance of alkalinity and calcium ions that can be added to your aquarium to help supplement what your corals consume when they grow. It is pretty easy to see where the calcium is derived from but the alkalinity can be a little more difficult to see, and when Kalkwasser is added to your saltwater tank a simple reaction takes place converting the hydroxide into available bicarbonate ions. Essentially the CO2 in your water and atmosphere will react with the hydroxide ions creating bicarbonate ions and increasing your tank's pH, due to less available carbon dioxide. Want to see how BRS Pharma Kalkwasser stacks up against the others? This Kalk is clearly superior to other offerings. The powder is much easier to scoop without getting everywhere and it mixes fast and clean. Glad I switched over and I’m excited to see the results in my tank with less impurities being added from this new cleaner kalkwasser. This new Kalk powder does not work well in my Avast stirrer, the residue packs tightly in the bottom and has stopped my stirring mechanism from spinning. I like the old powder better. With this I have to scrape it out of the cylinder bottom to clean it. I've been using BRS Kalk for years. I really preferred the old version, it was less expensive, came in a better container and had less residue after settling. The new stuff is OK, and I'll keep using it, but I'm not sure why they changed a great product to make it worse. If you’re going to use kalk in an ato, you should be test your ph and alkalinity daily. This ensures you won’t nuke your tank and that you’re keep things stable. If you choose not add this simple test which your tank will benefit from anyways then you’re the only one responsible for your tank issues not brs. I’ve been in this trade as a hobbyist for 18 years and spent the last 4 years as a professional. None of the other kalk provide by other companies is as strong as this stuff. On top of that it clears almost instantly after the initial mix and saturation. I use a gravity fed ato and I mix my solution then after it has settles it’s poured into the holding res. The mixture’s then delivered to my tank via a float valve. The single most effective means of help stability in an sps tank other then a CRx. There’s a few reviews that make no sense kalk is going to leave residue/sediment regardless. If that’s a problem either you don’t understand the premise of how kalk is utilized or you need to find a deferent method that suits you better. Secondly you should always add your kalk mixture slow if you use a digital ato with an actual pump you need to use a aqualife or dosing pump to be safe. Not a pump that’s going to do 100’s of gallons per hour after head loss. Ultimately gravity fed ato setups are going to be safest and most effective because they literally can match your evap rate. Please stop bashing a great product for your own discrepancies. Having used other brands (ESV, TLF and Seachem) with equally good results, I nevertheless disliked the messy sediment that accumulated from said products. I was encouraged to use the BRS Kalkwasser as it claimed to leave much less residue. Unfortunately, after just one night of use, I looked in the following morning and was surprised to see a comparable amount of sediment at the bottom of my reservoir. There is no reason to think it will not perform, as well as, or better, as other marketed brands, at a lesser price. But if anyone is buying it in the hopes there is less sediment, compared with other brands, they might be disappointed. Followed advice from the BRS team and then was told the info on the package was incorrect? Nuked a 5 year established tank doing the ATO method suggested. Calculated evap rate, etc. BRS support contradicts advert and instructions printed on label. Know what you are doing and do your own research if you decide to use this; don't listen to BRS support or printed instructions. This kalkwasser is easy to mix. Also easy to use with an ATO once you have your parameters dial in.. This product is a great beginner way into keeping your cal and alk up with just your ato. I've been running it over a year now and my nano reef tank is doing great. I've been using this product in my BioCube14 Nano mixed reef for approximately 6 months now. I mix 2 teaspoons in 1 gallon of RODI water and shake well. It takes a couple of days for a very thin layer of residue to settle at the bottom of the container leaving a nice clear saturated kalkwasser solution above ready for use. I remove the clear solution from the mixing container (leaving the residue layer behind in the mixing container) and pour the clear solution directly into my make-up water reservoir. The kalkwasser is automatically dosed every time the auto top-off system does it's thing. I use an Auto Aqua Smart ATO - Micro (which has worked flawlessly for more than a year now) and I submerge the ATO pump directly in the kalkwasser-filled reservoir. After six months of operation I removed the pump to inspect and clean as required. I expected a build up of white crusty material throughout the pump but in fact it was very clean. I did little more than rinse the pump with fresh water and wipe it off before reinstalling it (I still keep a spare pump on hand just in case). Prior to using this BRS kalkwasser product my pH was consistently between 7.8 and 8.1 (measured with an electronic pH probe). Since introducing this product and dosing method my pH is consistently between 8.1 and 8.3 including during the nighttime when the pH drops toward the lower end of this range. My 'critters' are happy with the results and so am I. ONE NOTE OF CAUTION: This product is a very fine powder that easily goes airborne when being handled; even very gently handled. Protect your health by avoiding inhalation or letting it come into contact with your eyes. Happy reefing! The bags of PHARMA KALKWASSER are sold per pound, and the dosing instructions are by volume (teaspoons.) Can you give us an idea of how many teaspoons are in each bag? The 2-pound bag will contain just under 9 cups of kalkwasser which would be about 141 teaspoons per 2lb bag or 282 teaspoons per 4-pound bag, but this powder can be compacted so the actual number may differ based on how you measure it. Have a great day!